I had so much left over pie dough from making a Strawberry Rhubarb Pie and Lon has been asking, what are you going to do with it? He claims he doesn’t like dessert, but he eats every dessert that walks by. 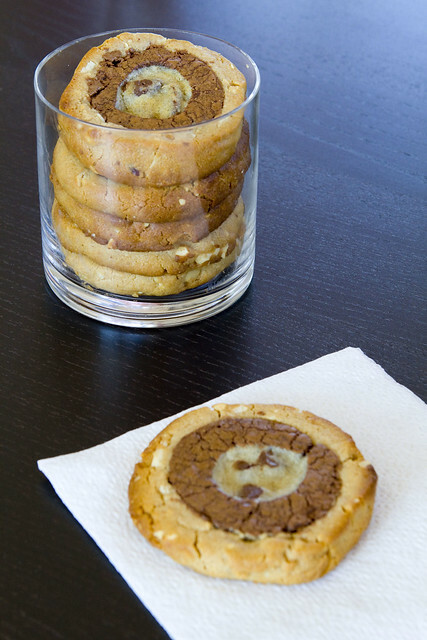 Suddenly, late afternoon, I started craving chocolate chip cookies and I thought, how perfect, I’ll make a cookie pie. I saw this recipe, on Bakerella, that was so interesting because it doesn’t start with creaming the butter and sugar. The pictures looked delicious and convinced me to try this method, although I did alter a bit. Eating these really made me feel like a kid again. I don’t know why, considering I never had cookie pie as a kid but, hey whatever makes us feel young right? Every year at Passover, I can’t wait till we get to dessert, mostly because of Bonnie’s (Lon’s mom) Chocolate Chip Pecan Mandelbrot. 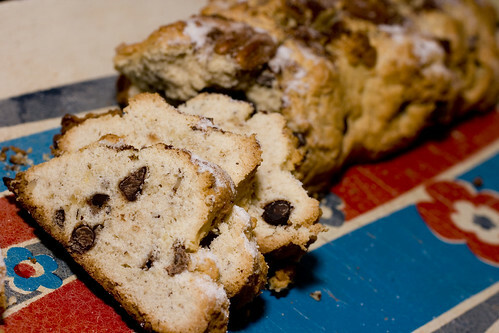 If you haven’t had Mandelbrot, it’s a cross between biscotti and scones. I love it! I had Chocolate Cream Cheese Frosting left-over from the Drunken Cupcakes and I couldn’t just let it go to waste. Instead of more cupcakes, I decided on cookies. (Most frosting are great as a cookie filling too.) These Chocolate Oatmeal Sandwich Cookies are not sophisticated; they’re more the kind kids love to eat and smear all over themselves. 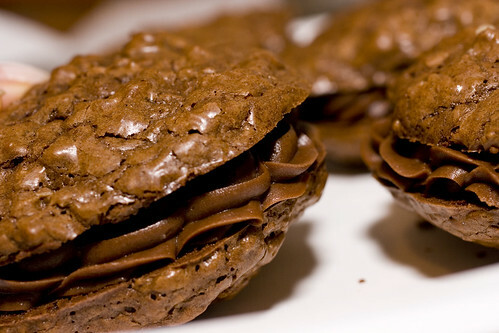 They are very chocolaty and somewhat chewy and some said they were like brownies. A little less than a year ago, I left my last office job (ever, I hope). I haven’t really kept in touch with my old co-workers, but oddly, I am still good friends with the office that was down the hall. The small boutique office of Signature Bank was just the coolest little group that I really enjoyed eating lunch with almost daily. I went back to visit them yesterday, had lunch with Anthony, but of course I had to bring them something. Brownies are one of those easy to transport things that you should keep in your repertoire. These are just a little extra special because they’ve got a raspberry swirl. Our niece Sabrina had a fabulous backyard first birthday party yesterday. Bonnie, Sabrina’s grandma, made burgers, hot dogs, cedar plank salmon, potato and pasta salads, fruit, and desserts, the works! Of course, I had to make something. Sabrina doesn’t eat much solid food yet but she’ll see these pictures in the future and I am just ensuring my spot as favorite aunt. 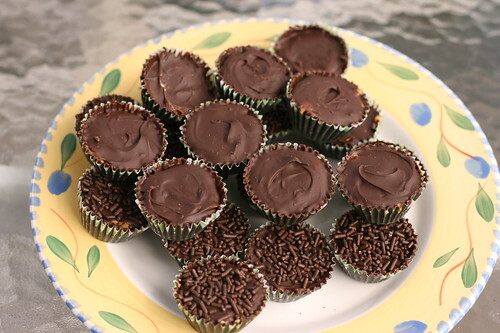 I have been waiting till after the wedding to make peanut butter cups because they are pretty decadent. My friend Angie has been raving about Emeril’s Banana Cream Pie for a while. She had it in Florida years ago and has been hoping to have it again one day. For her birthday, I invited her over for dinner and surprised her with Emeril’s Banana Cream Pie. She said, it tasted just like she remembers. All of us agree that it is a phenomenally delicious pie but there were a couple of issue with the recipe that I’d like to point out (notes are in red). In a mixing bowl, combine the egg yolks, cornstarch and 1 cup of the heavy cream. Whisk to blend well. Set aside. Combine the remaining 2 cups cream, 1 1/2 cups of the sugar, and the vanilla bean in a large heavy-bottom saucepan over medium heat, Whisk to dissolve the sugar and bring to a gentle boil, about 10 minutes. Slowly add the egg yolk mixture, whisking constantly until it thickens, about 5 minutes. Be forewarned: the mixture will break. Don’t be alarmed! (The mixture should not break!!! )Pour it into a glass bowl. Press a piece of plastic wrap down over the surface of the mixture to prevent a skin from forming. Let cool completely at room temperature. Preheat the oven to 350 degrees F. In a mixing bowl, combine the graham cracker crumbs, the remaining sugar and the mashed banana. Mix thoroughly. Add the butter and mix well. 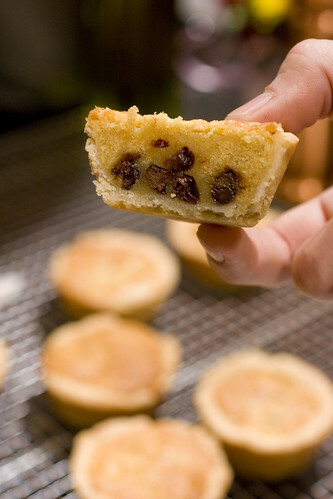 Press the mixture into a 9-inch pie pan. Bake until browned, about 25 minutes. Remove the pan from the oven and cool, for about 10 minutes. 1. In a small, heavy-bottomed saucepan, combine the sugar and water and bring the mixture to a boil, stirring often. Cook, stirring occasionally, until the mixture is a deep caramel color and has the consistency of a thin syrup, 10 to 15 minutes. Remove from the heat. Stir in the cream, return the saucepan to the high heat and boil the sauce until it regains the consistency of a thick syrup, about 2 minutes. Cool. 2. The sauce can be refrigerated until ready to use. Allow it to reach room temperature before drizzling it over the pie. 1. Combine the half-and-half and butter in a small heavy-bottomed saucepan over medium heat. Heat the mixture until a thin paperlike skin appears on the top. Do not boil. Add the chocolate and vanilla and stir until the chocolate melts and the mixture is smooth. 2. Remove from the heat and let cool. 3. The sauce can be kept refrigerated for several days, but it must be returned to room temperature before serving. 2. Cover with plastic wrap and chill for at least 4 hours. In summary, I recommend making this recipe in a pan with higher sides like a 9-inch springform or just use less custard and bananas. Or, better yet, just make it as a trifle! It would be absolutely perfect. Also, just forget the caramel and chocolate sauces. They don’t add anything to the already delicious banana and real vanilla flavor.